Not to be confused with Fahrenheit 11/9. Fahrenheit 9/11 is a 2004 American documentary film directed, written by, and starring filmmaker, director and political commentatorMichael Moore. The film takes a critical look at the presidency of George W. Bush, the War on Terror, and its coverage in the media. In the film, Moore contends that American corporate media were "cheerleaders" for the 2003 invasion of Iraq, and did not provide an accurate or objective analysis of the rationale for the war or the resulting casualties there. Moore moves on to examine George W. Bush's Air National Guard service record. Moore contends that Bush's dry-hole oil well attempts were partially funded by the Saudis and by the bin Laden family through the intermediary of James R. Bath. Moore alleges that these conflicts of interest suggest that the Bush administration does not serve the interests of Americans. The movie continues by suggesting ulterior motives for the War in Afghanistan, including a natural gas pipeline through Afghanistan to the Indian Ocean. At that time, Disney was the parent company of Miramax. According to the book DisneyWar, Disney executives did not know that Miramax agreed to finance the film until they saw a posting on the Drudge Report. Michael Eisner (the CEO of Disney at that time) called Harvey Weinstein (co-chairman of Miramax at that time) and ordered him to drop the film. In addition, Disney sent two letters to Weinstein demanding Miramax drop the film. Weinstein felt Disney had no right to block the releasing of Fahrenheit 9/11 since the film's $6 million budget was well below the level that Miramax needed to seek Disney's approval, and it would not be rated NC-17. But Weinstein was in contract negotiations with Disney, so he offered a compromise that he would drop the film if Disney did not like it. Disney responded by having Peter Murphy send Weinstein a letter stating that the film's $6 million budget was only a bridge financing and Miramax would sell off its interest in the movie to get those $6 million back; according to the same letter, Miramax was also expected to publicly state that it would not release the film. 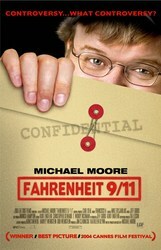 Fahrenheit 9/11 was screened in a number of Middle Eastern countries, including the United Arab Emirates, Lebanon, and Egypt, but was immediately banned in Kuwait. "We have a law that prohibits insulting friendly nations", said Abdul-Aziz Bou Dastour of the Kuwaiti Information Ministry. The film was not shown in Saudi Arabia as public movie theaters are not permitted. The Saudi ruling elite subsequently launched an advertising campaign spanning nineteen US cities to counter criticism partly raised in the film. The film was shown in Iran, an anomaly in a nation in which American films had been banned since the Iran hostage crisis in 1979. Iranian film producer and human rights activist Banafsheh Zand-Bonazzi communicated with Iranians who saw the film, and claimed that it generated a pro-American response. The film was received positively by critics. It received an 83% Fresh rating on Rotten Tomatoes based on 229 reviews. It also received a score of 67 (generally favorable) on Metacritic, based on 43 reviews. The consensus according to Rotten Tomatoes being "Extremely one-sided in its indictment of the Bush administration, but worth watching for the humor and the debates it'll stir". Film critic Roger Ebert, who gave the documentary three and a half stars out of four, says that the film "is less an exposé of George W. Bush than a dramatization of what Moore sees as a failed and dangerous presidency". In the film, Moore presents footage of Vice President Al Gore presiding over the event that would officially anoint Bush as president, the day that a joint session of the House of Representatives and the Senate would certify the election results. "Moore brings a fresh impact to familiar material by the way he marshals his images", says Ebert. Entertainment Weekly put it on its end-of-the-decade, "best-of" list, saying, "Michael Moore's anti-Bush polemic gave millions of frustrated liberals exactly what they needed to hear in 2004--and infuriated just about everyone else. Along the way, it became the highest-grossing documentary of all time." Nine months after Fahrenheit 9/11 received the Palme d'Or, George W. Bush, Donald Rumsfeld, and Condoleezza Rice won the Worst Actor, Worst Supporting Actor, and Worst Screen Couple (Bush/Rice) in the 25th Golden Raspberry Awards because of their mishandling of the 9/11 attacks and the Iraq War. Britney Spears, who appeared in the film in a cameo where she expressed her support of Bush, won the Golden Raspberry for Worst Supporting Actress. ^ abc "Fahrenheit 9/11". Box Office Mojo. Retrieved 2 October 2011. ^ ab "Fahrenheit 9/11 (Fahrenheit 911)". festival-cannes.com. Archived from the original on 18 January 2012. Retrieved 2 October 2011. ^ Banafsheh Zand-Bonazzi (29 September 2004). "Iranian Citizens Trash Fahrenheit 9/11". frontpagemag.com. Retrieved 3 October 2011. ^ ab "Fahrenheit 9/11". Rotten Tomatoes. Retrieved 3 October 2011. ^ Hollywood and the war machine (Television production). Empire. Al Jazeera. 2012-08-06. Event occurs at 20:05. Retrieved 2012-09-03. ^'Fahrenheit' lights fire in Cannes debut, The Hollywood Reporter. May 18, 2004. Archived September 30, 2007, at the Wayback Machine. ^Anti-Bush film tops Cannes awards, BBC News Online. May 24, 2004. ^2005: And the Nominees Are..., The People's Choice Awards. Last Visited Friday, Nov. 28, 2014. In Fahrenheit 9/11, Michael Moore’s potent and infuriating fight-the-power documentary, the most memorable indictment comes early on. It’s the moment you’ve heard about, but probably never seen, of President George W. Bush sitting in a Florida grade school and reading the book ”My Pet Goat” for a full seven minutes after he’s been told that the second plane has hit the World Trade Center. The power of the footage transcends virtually any issue of left, right, or center. Bush wears a look of pale suppressed horror, yet an executive decision seems beyond him. He’s portrayed as a man who can and will not act, a President — a President! — who greets this most calamitous of events by waiting for others to tell him what to do. On the soundtrack, Moore guilt-trips Bush by speculating, mischievously, as to his thoughts. Moore’s voice is pitiless in its didactic sarcasm, yet he gets at something essential about the inner Dubya. Watching the footage, you don’t doubt that Bush’s anguish was genuine, yet you also can’t help but wonder if it reflected his ultimate slacker nightmare: that the job was now going to be exponentially harder than he’d bargained for. At moments like that, ”Fahrenheit 9/11” offers a catharsis for the audience. Dazzlingly assembled, at once reckless and insightful, the movie filters the actions of the Bush administration through a nose-thumbing outrage that might have been irresponsible if Moore’s own words weren’t girded by images that spoke 1,000 more. 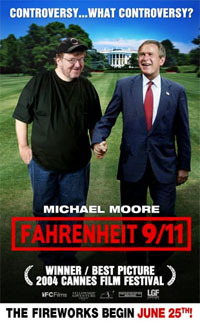 Watching ”Fahrenheit 9/11,” you may find yourself rejecting one line of attack (like, say, Moore’s opening salvo about the Republicans stealing the election), chuckling at an irresistible cheap shot like clips of Bush on his ranch set to the Go-Go’s’ ”Vacation,” and responding to such richly evocative gambits as the movie following two Marine recruiters who seek out a working-class shopping mall to prowl for new enlistees. When the filmmaker hits the streets of Washington himself, wandering up to random congressmen to ask if they’d consider sending their own children to fight in the Iraq war, you’re reminded of how Michael Moore dramatizes, in a way no one else can touch, the distance and hypocrisy of power. ”Fahrenheit 9/11” sharpens the focus on power, and it reveals the cataclysm of Iraq — the blood and the turmoil, the hidden doubts of the soldiers — in a way that makes the official news coverage look like a dryly censored press release. At times, I felt moved and manipulated at the same moment, notably when Moore interviews Lila Lipscomb, a Flint woman whose son was killed in Iraq. Her tears and anger bring the war home, yet Moore won’t let go. He follows Lipscomb to Washington and films her in front of the White House, where she gets into a shouting match with a woman on the street. The mix of grief and showboating reduces Moore’s empathy to a thin parody of empathy. Moore portrays the Bush era as a series of sinister forces run rampant, with a puppet firebreather in charge. Yet what, according to the movie, is the essence of the administration’s corruption? That it used 9/11 as an excuse to increase oil profits? To frighten all Americans into giving up their freedom? To keep the workingman down? As analysis, ”Fahrenheit 9/11” is mostly a smash-and-grab polemic. It’s less cogent or searching than Moore’s ”Bowling for Columbine,” which looked at one issue — gun violence — from every angle, until Moore had surprised himself with what he discovered. In ”Fahrenheit 9/11,” Moore makes the devastating point that the attempt to hunt down Osama bin Laden in Afghanistan wasn’t as all-out as it pretended to be. Many more troops could have been deployed. Yet the scandalous explanation for this strategic botch — that the administration was holding back for the war in Iraq, already in the planning stages — is never even mentioned in the movie. Where to locate that ultimate damning analysis? Why, in any one of the countless TV interviews given by Richard Clarke more than two months ago.